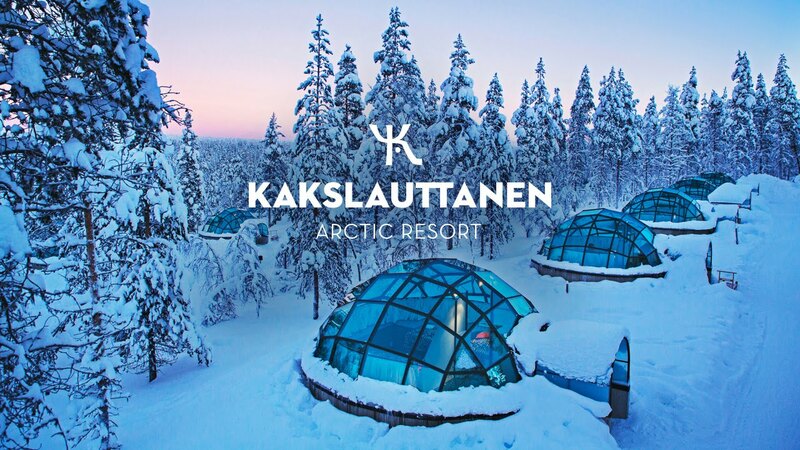 Kakslauttanen is the well-known Lapland resort in Finland with glass igloos and traditional wood chalets. The place to experience snow activities and the Northern Lights. Husky, reindeer safaris and snowmobiling can be arranged. Location: 4/5 41 km from Ivalo airport. 11 km from Saariselkä village and ski resort. Recreational facilities: 5/5 2 à la carte restaurants, smoke sauna, ice hole, husky and reindeer safari, Santa's village, snowmobile safaris, Northern light guided tours. Comfort level: 4.5/5 Glass igloos from basic to upgraded with sauna. Style: 4.5/5 Glass igloo classics with round-shaped glass dome, wooden cabins with glass roof bed-rooms. Value for money: 3.9/5 Price from 467€/night. Quite expensive accommodation in comparison with others. Finland - Lapland - Saariselkä. By air: Helsinki - Ivalo daily flights. Flight time - 1h40m. Price from 39€. Airport: 41 km. From airport: bus to Saariselkä+taxi, or taxi from airport (35km). By train: Helsinki - Rovaniemi daily trains. Duration - 8-12h. Price from 68€. Station: 250 km. From train station: bus to Saariselkä+taxi or rental car self-drive. 2 person glass igloos with WC. Double bed or 2 single beds. Extra bed for child possible. Shared showers and saunas are in separate building. Small glass igloo are available for rent during Northern Lights season: from third week of August until the end of April. Igloo price includes accommodation, half-board (breakfast and dinner). 2-4 person glass igloos with WC and shower. Double bed and 2 single beds, or 4 separate beds. Shared sauna and showers are also available in separate building. Large glass igloo are available for rent during Northern Lights season: from third week of August until the end of April. Kelo-Glass igloo is a comfortable log cabin with the panoramic sky view glass dome bed-room in the attic. Up to 6 sleeps. Private sauna, fireplace, kitchenette, and a bedroom with a glass roof. Kelo-Igloos are located at West Village of Kakslauttanen resort (about 5 km from the East Village - older part of the resort). More about Kakslauttanen Arctic Resort and what to do there. Saariselkä is the northernmost Ski Resort in Finland. Located 10 km from Kakslauttanen. Some easy sreps and tips how to inclease the chanses to see the Northern Lights in Lapland. * Classical glass round-shaped igloos and luxury sky view accommodation. * Cheap and high-priced igloos. * Where igloos are located. * How to see the Northern Lights from an igloo. There are about 30 glass igloo villages and resorts in Finnish Lapland. You'll find a list of all glass igloo hotels. Compare and choose suitable igloo based on location, rates, facilities or style. Our Lapland experts ready to help with an advice. You can contact us via Skype, Viber, WhatsApp, Facebook, e-mail. The Polar Night Jazz Festival 22.11.2018 - 25.11.2018 in Inari-Saariselkä Region will bring together some of the best Finnish performers, local sami artists and also an international guest from the Netherlands. The festival programme is offering a variety of events, from dinner concerts at a banquet hotel or a cosy gourmet restaurant to short introductory performances at the central event corner, JazzArena or more intimate concerts in the local chapel or nature hut in the forest. This is legendary and probably most farmhouse glass igloo resort in Finland, Lapland. People from all over the world come here to see the Northern Lights and try all sorts of Lapland activities. The Kakslauttanen is divided in two villages: East village (older one) and West village (newest one). Each of them has their own glass igloos, wooden cabins, restaurant, reception and activities. The Kakslauttanen open year-round except for May. Glass Igloos are open for rent during Northern Lights season: from 24-25 of August until the end of April. Where Kakslauttanen is located and how to get there? Kakslauttanen is located in the wilderness, 250 km north from the Arctic Circle. International Ivalo airport – 30 min drive away. Finnair and Norwegian fly regularly between Helsinki and Ivalo. Also direct seasonal flights from London, Frankfurt available. You can book your airport transfer at the same time as booking your stay at Igloos. It is possible to combine a stay in Kakslauttanen with a stopover in Helsinki, as all flights to Lapland depart from Helsinki-Vantaa Airport (HEL). So come to Helsinki, take a break for 1-2 days here and then catch a connection flight to Ivalo. Buses to and from Rovaniemi all stop at Kakslauttanen. Journey takes about 3 hours. It is possible to come here by car. Resort is located either side of the main northbound Lapland highway to the North Cape, Norway. Kakslauttanen Arctic Resort address: Kiilopääntie 9, 99830 Saariselkä. Be aware of snow-ice covered roads during winter season and studded tires is necessary! Is it really possible to see the Northern Lights lights from Kakslauttanen Igloo? The location of the resort is just perfect for seeing the Northern Lights. As soon as Aurora is a priority for the Kakslauttanen, igloos are designed the best way to see and enjoy it. No light pollution, very few trees obscuring the sky nearby, ice-frost free glass, Aurora alarm service available. The Northern Lights season lasts from late August to late April. However, nobody can guarantee Northern Lights during your stay. More tips how to see Northern lights and Aurora Alarm services. Try Last Minute deals for igloos! Price can be with discount up to 10-30%! Check prices from Sunday to Monday night. It might be a little cheaper than normal price. Good to know when planning a trip to Kakslauttanen Arctic Igloo resort. # There are no food shops at the area. Food at restaurant can be expensive. # The nearest supermarket is 10 km away from Kakslauttanen. If you do not have a car, the only way to get there is to order taxi. Price for return trip might be up to 50 euro. # Glass Igloos are quite small and hard to share for non-couple or family. Choose Kelo-Glass Igloo if you have more then 2 persons. # Glass Igloos are quite basic inside, no luxury, just great views. # Igloo check-in is around 14:00-15:00. Check-out is at 10:00. # If you come early, there is a possibility to leave luggage in the luggage room. You are welcome to join some activities while waiting for the check-in. # You can use wooden sleighs to take your luggage into igloo. Luggage service also available for extra fee. # Best time to visit Lapland and Kakslauttanen igloos? October - December might be quite snowy time with a lot of clouds. January might be quite cold. From mid February to end of April is the optimal time. # Do not be afraid of coldness in Lapland. It can be quite cold there, but air is dry and no wind when it is freezing. Also you can find all the winter clothes for hire there.